Unlike in most parts of the world, in Russia Women’s Day is no low key affair that hardly gets noticed. The festive ambience in the country during the holiday is only outdone on New Year’s Eve. Russian men take great pride in the beauty of their womenfolk and it’s almost impossible for a visitor to leave the country without hearing at least once from someone (and usually a man) that Russian women are the most beautiful on earth. While this is a common and patriotic adage in many countries, the sheer conviction with which Russian men celebrate the beauty of their women is incomparable. I found no need to argue with my Russian friends since I could easily see that the streets of any Russian city, be it St. Petersburg or Petropavlovsk-Kamchatsky, contained a disproportionate number of beautiful women. It isn’t just natural beauty that sets a Russian girl apart, rather it is the way the average Svetlana or Natasha dresses and carries herself. There’s even an elegance and grace about the way a Russian woman wearing heels runs on the ice on a freezing winter morning to catch a bus to work. You can also tell the scent of a woman apart even in the most crowded wagons of the Moscow metro. In a city as large as Moscow, where people travel for more than an hour in the metro just to get to work, I felt nothing but admiration for those who would be so well groomed at 7 am in the city centre on a working day. Now, it took a lot of work and dedication to look one’s best, throughout the day. I remember watching an emotional film once in Moscow with a Russian friend, who was moved by the plot and performances of the actors, but didn’t shed a tear. She told me later that crying would have messed up her make-up, so she decided to cry her heart out after getting home and out of public view. In Yuzhno-Sakhalinsk, one could often hear mutterings from Dutch and English wives about how they hated the way a Russian woman looked dressed for a party at any time of day. Hidden somewhere in these complaints was the fact that they didn’t enjoy the attention that their husbands paid to local women. While hiring a rather beautiful reporter, I was asked an odd question about the working conditions in the office. “How come there are no mirrors in this room,” the reporter asked me. She said she needed a big enough mirror to look her best on winter mornings after removing her cap and other winter accessories. She’d even need the mirror on humid summer days when the make-up wears off on the way to work. In Russia, it is also not an uncommon sight to see the most elegant and well-dressed woman walking hand in hand with an unshaven and rugged-looking man. Maybe one reason that some Russian women have a liking for foreign men is that they actually tend to notice and appreciate the effort that Russian women put to look their best. Russian men, though, try to make up for 364 (or 365 in a leap year like this one) days of under-appreciation with one day full of love, toasts, respect and attention on March 8, International Women’s Day. Unlike in most parts of the world, Women’s Day is no low key affair that hardly gets noticed. March 8 is one of Russia’s most important holidays. When it comes to urban beauty, very few images compare to the sight of red rose petals on freshly fallen snow on the sidewalks of Russian cities on Women’s Day. 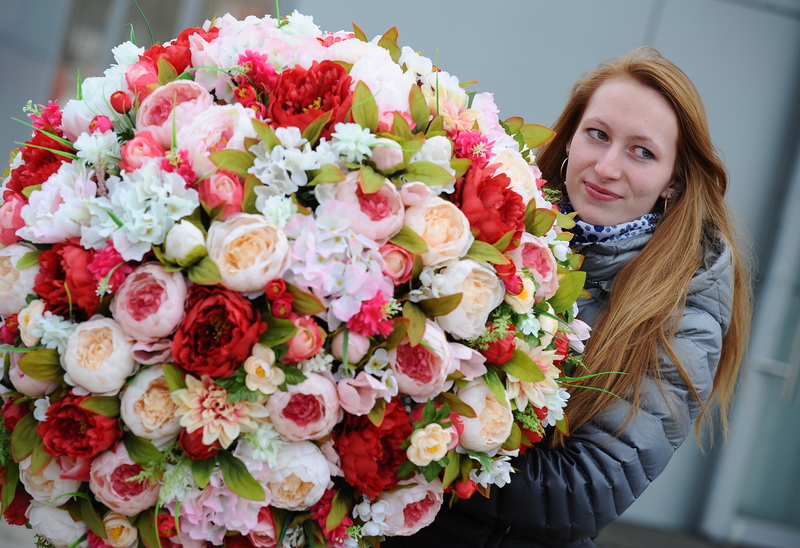 Roses are by no means inexpensive in Russia but in the run up to Women’s Day, prices of all flowers sky-rocket. I once advised a visitor to Russia from Bangalore to bring as many roses as he could in the first week of March. The five rupees (10 cents) per rose on the streets of the Indian city compared very favourably to the 600 roubles ($10) that it cost in Yuzhno-Sakhalinsk. On Women’s Day, it’s difficult to call for radio taxis, despite prices being jacked up. Just about everyone is away from home on yearly rounds to give gifts to the special women in their lives, and this includes siblings, teachers, friends, parents and of course lovers. Shops also have special promotions for imported chocolates and “Sovetskoye Shampanskoye,” a generic Russian sparkling wine, which uses the ‘champagne’ name. Along with gifts, toasts are an integral part of the holiday. There are very innovative ways to toast the “most beautiful women in the world.” The festive ambience in the country during the holiday is only outdone on New Year’s Eve. National television channels often screen some classics from the bygone days. One such film is the Oscar-winning hit from 1980, “Moscow doesn’t believe in tears,” a movie that Ronald Reagan apparently saw 6 times to understand the Russian soul. Women’s Day also tends to lift the spirits of both men and women who are sick of the long Russian winter and eagerly looking for any hint of spring. Spring arrives a lot earlier in central Russia than it does in Sakhalin and other parts of the Russian Far East. In the far outreaches of Russia, many combine the Women’s Day holiday with a few days off and head off ice-fishing or on camping expeditions to remote locations. On one occasion, when Women’s Day fell on a Thursday, the Sakhalin authorities made Friday a holiday and Sunday a working day. That gave many of us an occasion to celebrate the holiday on the frozen Sea of Okhotsk in an area called Tihaya Bay. Sakhalin’s adventurous women welcomed their holiday by scaling up icy peaks and showing off their alpinist prowess in “spring” temperatures of minus 30 degrees Celsius. Women’s Day in itself signalled that warmer temperatures were just around the corner. For those who have Russian women colleagues and friends outside Russia, March 8 is the perfect occasion to make them feel special. A small gift and maybe two lines of a traditional Russian Women’s Day toast would easily make a Russian woman’s day, especially when one considers the fact that one of Russia’s biggest holidays goes by without the slightest hint of fanfare almost anywhere outside the former Soviet Union.